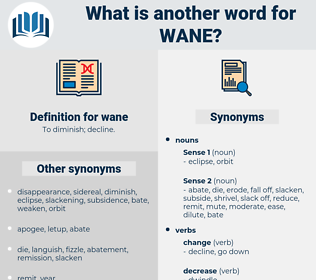 What is another word for wane? 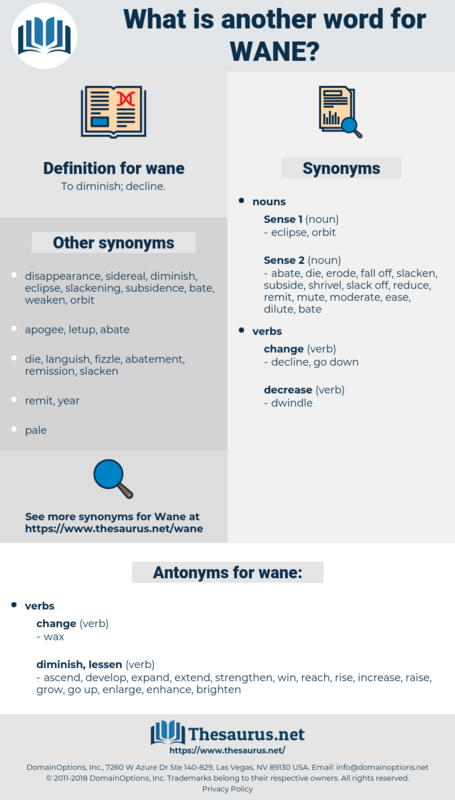 diminish, slacken, dwindle, lessen, reducing, shrink, falter, decrease, waver. ascend, develop, expand, extend, strengthen, win, reach, rise, increase, raise, grow, go up, enlarge, enhance, brighten. swell, blow up, distend, build, climb, full, lengthen, soar, emerge, show up, appear, elongate. The disasters of the Thirty Years' War, the jealousies and ambitions of the other German princes, the interested intervention of foreign powers, notably Sweden and France, made it brutally clear that Habsburg influence in the Germanies had already reached its highest pitch and that henceforth it would tend gradually to wane. The glories of the South End began to wane.